Egg Harbor’s Holly Days is November 29-30th, 2013, but that’s not the only reason to visit Egg Harbor this winter… Check out the local shops and galleries for unique gifts and stocking-stuffers, get out and enjoy the snow, and sit back and warm up with a mug of something hot! Stop for a meal and brew at Shipwrecked, Door County’s own microbrewery, and take home a six pack of Bayside Blonde, Door County Cherry Wheat, or Peninsula Porter, and try Lighthouse Light or Pumpkin Ale (for a limited time) on tap! Shipwrecked is serving every weekend all winter long. Greens N Grains Cafe is also open all year, Thursday – Saturday from 10am–3pm, and features vegetarian, organic and raw food cuisine, in a tasty selection of paninis, wraps, hummus, natural and organic specialties. Grab a cup at their full service coffee and espresso bar, or try freshly-pressed veggie juices, fruit smoothies, and healthy bakery, and stay connected with free Wi-Fi! Stay for two weekend nights and relax by the fireplace at the Door County Lighthouse Inn and watch the snow fly while enjoying a cup of hot cider, popcorn, and cookies (upon request). 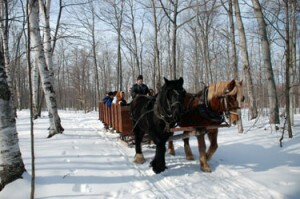 On Saturday, join the Door County Trolley for a Winter Wonderland Tour where you will wine taste at two of Door County’s award winning wineries, followed by a cozy sleigh ride thru “The Doors” most beautiful wintry landscapes. Top it off with a fireside lunch at the historic White Gull Inn. In the evening you will experience an elegant dinner at the English Inn with your $50 dinner coupon towards dinner. As an added feature a $25 Door County Gift Certificate is yours and can be used at most shops and restaurants in Door County. Price: This two night package rate is between $401.00 to and $491.000 depending upon room selection. 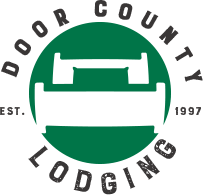 Don’t forget to mention Door County Lodging when booking! We hope you enjoy Door County! Spend New Year’s in Door County!